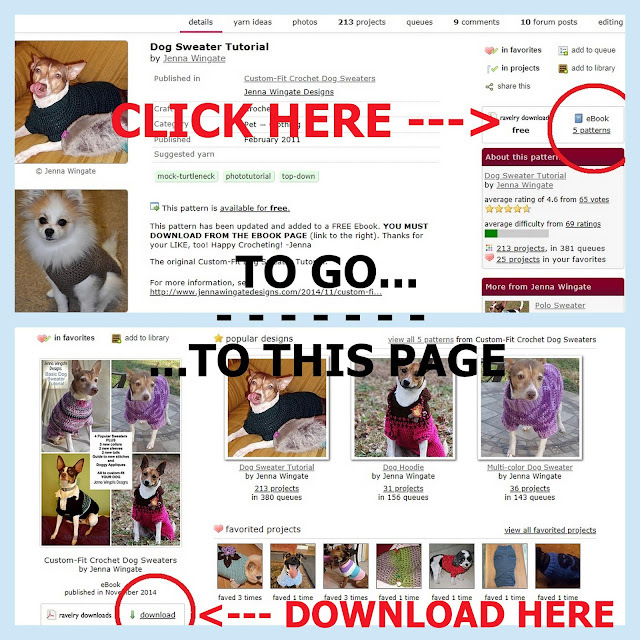 35 pages of dog sweater goodness! 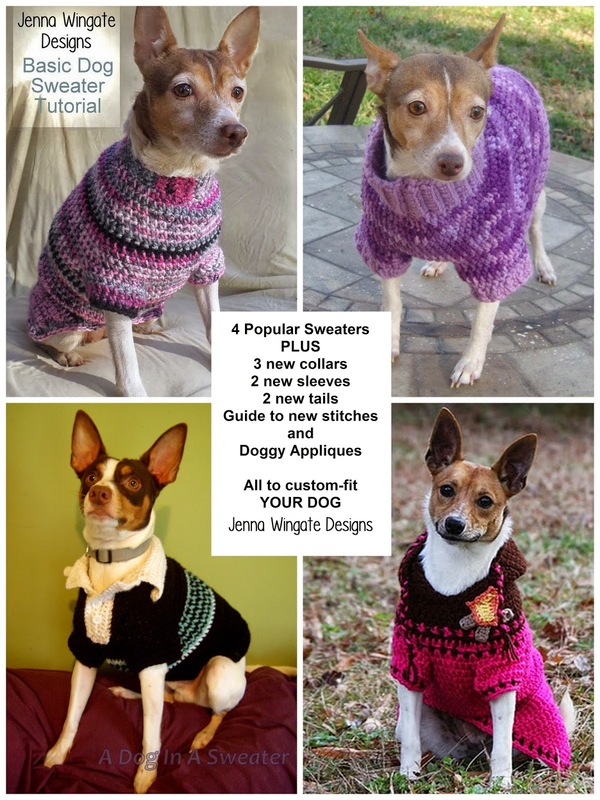 These patterns do not go by sizes- they go by your dog's measurements- so you know it will fit better than any other sweater they've ever had!!! The first sweater was written in 2009, so this has been a big 2-week project, rewriting and compiling extra stuff, tips, and hints to make the ultimate jumping-off point for the best winter yet for dog sweaters! See Projects made from the EBook! A little preview of the new stuff! A teaching pattern that is suited to any motivated crocheter with basic crochet skills! More pictures and step-by-steps than you can shake a stick at! ADD TO YOUR RAVELRY QUEUE! Note: Ravelry does not allow you to add the entire book to your queue, but does allow you to add the individual patterns in it. All FAVORITES are greatly appreciated! Ravelry has made some changes, so you now must go to the ebook page to download. On an individual pattern page, find the Ebook link to the right. On the Ebook page, the download link is to the left. P.S. If you are interested in translating this pattern into another language, please EMAIL me so we can make a plan! Much thanks! Pattern Usage: I have always asked that this pattern not be used for profit. It was intended for practical use and to pamper the ones you love. Please do not sell or copy these patterns. Please do not base any pattern you intend to sell on any of these patterns. I do whole-heartedly encourage you to donate and raise money for shelters and rescues, but if you do so in the form of selling finished items from any of my free patterns, please ask my permission first. I am always happy to help spread the word and often give away free copies of other patterns to help your efforts. Just drop me an email with a little info about your charity and event. Thanks so much for your honesty! 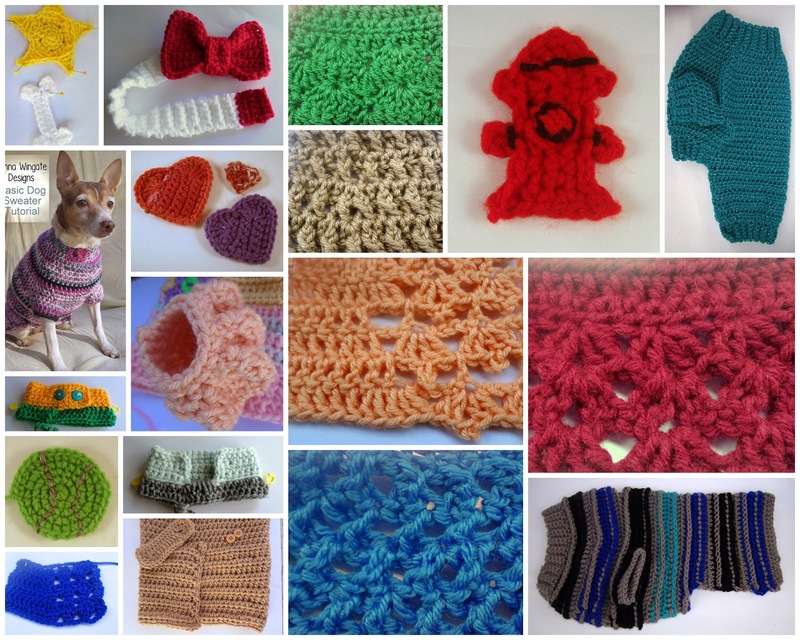 All of my FREE crochet patterns for pets are intended for personal use and charity. Because of the countless comments I have gotten recently in protest of this old request, I have had to turn off any future comments on this post. Every few years there is a new wave of crocheters who want to argue copyright law when I am only asking you to think about being a kind and generous person. I don't have the time or the spirit for unnecessary bull. Sorry. I will be very pleased to see your projects added to Ravelry. Keep the crocheting enjoyable for everyone. I love this tutorial! Thank you! I made one for my youngest dog, and it only took me three days! He hasn't wanted me to take it off him since I finished it yesterday. lucky warm pup! These are all Rat Terriers. Thanks, it's wonderful. I'm sure to use it on my dogs. I made a beautiful santa suit for my little short haired dog. It is so warm and comfy she doesn't like to take it off. It is out of the leftover red bamboo yarn with white fluffy polyester collar. We LOVE our rat terriers! Rowan and Olee! This is the perfect "If You Must Put a Sweater on Them" sweater lol That's my hub's comment lol They only put up with them on cold days :) Thank you for sharing!! On my To Crochet list! Made one for my dog, Dixie Doodle. Thanks so much for the pattern! Thank you so much for the ebook! My foster chihuahua will be so pleased! I saw your dog sweater patterns on craftsy. Didn't know where to find them. Soooooo, I finally sat down and looked at what was said and found them here! LOL.. Anyway, love your designs. I love these little sweaters! they are SO CUTE! Though, I have a quick question. While I know a few people that would love one of these as a gift, I was wondering if it would also fit a cat? My cat likes to hang out on the porch in the fall. H is getting older and I was wondering if these would fit him as well. The patterns will allow you to make a sweater for pretty much anything that walks on 4 legs. I've made them for cats, a ferret, guinea pigs, and a bunny. Some people have used the pattern to make sweaters for baby goats. Thank you sooo much!! I've been looking for a decent pattern!! Thank you so much. I have been looking everywhere for patterns for little dogs. Emmalise is a Chorkie. She is wittle wittle. About 2 lbs. Thank you! Just what I was looking for but much better because of all the extra options! I have been looking for a comprehensible dog sweater pattern for some time and yours certainly qualifies! My dog is a cross between a boxer and a pit bull and I am more concerned about her chest getting cold than her back. Thank you SO much for the obvious effort that went into the pattern. Thank you so much for this very useful ebook. I truly appreciate your time and expertise.